The best time to send emails that get a positive response unknown to many which is why (at times) we receive business promotional emails at 1:00 a.m. on a Saturday night to figure out in 2018. Fortunately, we have made it simple for you. 30+ hours of research and analysis got us the results that we have presented here. This also includes interesting tips and tricks regarding the sending time that will help you increase your open and response rates. There are two different aspects you have to keep in mind when you’re deciding on when to send an email that will get you a positive response. According to a stat by Epsilon, it’s important to choose the correct time of day when you’re sending an email because the average life of an email is below 48 hours. As stated above, you can’t send an email that you want to be taken seriously during the weekends. That’s a huge no-no from the start because people don’t do business and don’t even like to see business emails on a weekend. If you’re trying to reach business executives, Tuesdays and Thursdays are usually seen as the best response days in a week. This is what marketers say to be the best days for B2B emailing. Fridays are always overlooked when it comes to emails. But it may increase the chances of getting read as there is relatively little competition. If you’re confident that your campaign won’t ruin their weekend feels, you can go for Friday. Don’t forget about Mondays. Although everybody is very busy on a Monday, the response rates are over 45% at the start of the week because people do respond to emails on Mondays. The day of the week is just one part of having the best chances for your email to be read. You also need to be extremely careful of the hour you’re sending the email at. Before answering the question “what is the best time to send an email?” you first need to know who are you sending that email to. The time of day when you send the emails depends on the receiver. After a study conducted on over billions of email addresses, the results showed the best time to send your emails out is just at around 10 AM. That’s when most emails are opened anyways, so the chances of yours being opened grow dramatically. If you don’t have a good reason for doing so, avoid sending your email before this hour of the morning. Never send emails at 3 or 4 AM, as those will just look weird in the receiver’s Inbox. Lunch-time emails should be avoided. People are generally busy and have different timings varying from 1 to 4 o clock. It is better to lay low during these hours. When it comes to email campaigns, the game is all more interesting and harder than when you’re sending a simple email to one prospect. You’re talking hundreds, even thousands of emails that get sent at the same time, yet they reach different time zones all over the world and need to be received at the best times of days for those set time zones. Email campaign receivers are your future clients, which makes them different, unpredictable and unreliable when it comes to finding the best time to send them your emails. People in Norway, who are experiencing long daylight in the summer, are often known to open their emails in the mornings and afternoons. This means you can send them your emails at their preferred local time and get the most out of it. All you need is a simple email scheduling tool like SalesHandy. Schedule your emails for free! You can select the date, time and preferred zone with the help of this service. 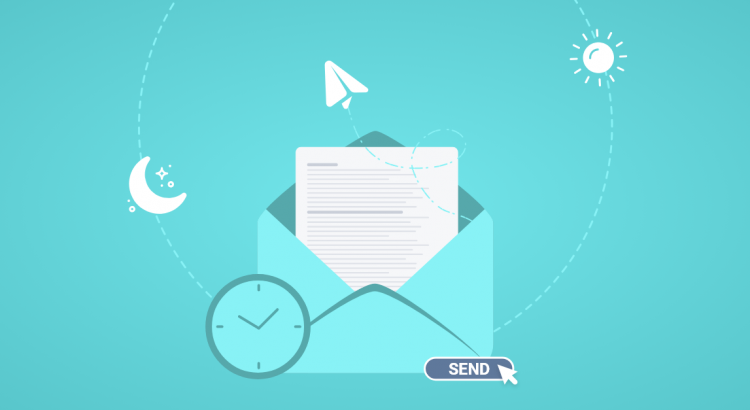 The feature simply helps you to stay on top of your recipient’s Inbox, because it makes sure that the email will hit the box as soon as the hour you provided hits, not sooner or later. When scheduling a campaign, the last thing you want to do is to manually add the times for each email group. With the help of the SalesHandy, you can do this with ease and focus on the content of your campaign, while the service will take care of your emails and deliver them at the optimal times regardless of the timezones. As you can see, the time and day when you send an email really depend on the type of campaign you’re having, the type of content you’re sending out and the audience you’re sending it to. By following these simple rules, you should be able to increase your response rate and get more out of your emails. Also, by combining your normal routine with a timezone email tracking service like the one from SalesHandy, you will surely be able to target the specific audience in the specific time frame on a specific date without having to do it all manually. Just set up the data in the app, get the email templates ready, paste in the addresses and you are good to go. As a final note, remember to always try out new things and strategies. The internet, as well as the behavior of your prospects, are constantly changing and remain unpredictable. Try to put yourself into their shoes and you’ll have a better understanding of how to go by your daily email blasts.